"Their courage will move the world forward," tweeted former San Francisco 49ers quarterback Kaepernick. "My Brothers @kstills and @ithinkisee12 continue to show their unwavering strength by fighting for the oppressed! They have not backed down, even when attacked and intimidated. Love is at the root of our resistance." Elsewhere on the first weekend of the NFL season, some players raised a fist during the The Star-Spangled Banner, while others stayed in the tunnel. President Donald Trump, a long-time critic of Kaepernick and the protests, tweeted on Sunday: "Wow, NFL first game ratings are way down over an already really bad last year comparison. Viewership declined 13%, the lowest in over a decade. If the players stood proudly for our Flag and Anthem, and it is all shown on broadcast, maybe ratings could come back? Otherwise worse!" 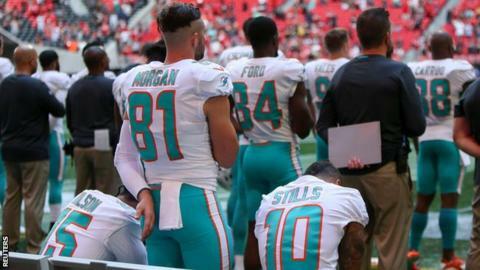 During pre-season the NFL said plans to fine players for anthem protests had been put on hold and ESPN has reported that a policy will not be introduced this season. Kaepernick has accused NFL team owners of conspiring not to hire him because of his protests, which started in 2016. The 30-year-old has been without a team since opting out of his 49ers contract in March 2017.